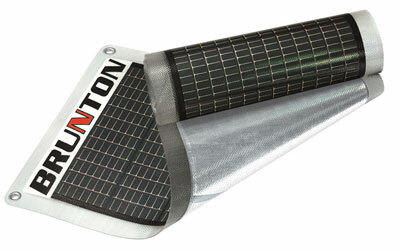 Brunton’s SolarRoll products are flexible plastic sheets with embedded solar paneling made for powering electronic equipment deep in the wilderness. The rolls weigh less than the average camp stove but output up to 14 Watts of power, which in my tests was enough juice to recharge a laptop computer. Developed with expeditions in mind, a SolarRoll can charge digital cameras, camcorders, GPS devices, satellite phones and other products in the most remote regions of the world. Casual campers may simply use them for convenience in parking lots, drive-in sites or other outdoors locations. The amorphous solar cells are effective in bright sunlight as well as on partly-cloudy days. To set up a SolarRoll, you simply unfurl the panel and drape it across a couple pine bows, the roof of a tent or any other place in direct sunlight. The SolarRoll automatically begins harvesting solar energy and converting it to electrical power. Brunton (www.brunton.com) includes two cables for connecting to various devices: The first cable has four standard plugs that work with the power outlet port found on common devices like laptop computers and satellite phones. The second cable includes a vehicle-outlet connection so it can be used with adapters made to power devices off a car’s cigarette lighter. While the standard-plug cable worked with my laptop computer, most devices I own were not compatible, including a digital camera, an iPod, my cell phone and a PDA. To charge those items with the SolarRoll, I would need to purchase the appropriate vehicle-outlet adapter and use it in conjunction with the Brunton cable. There are three models of the SolarRoll: The SolarRoll 14 ($399) measures 12 × 57 inches when unrolled and weighs 17 ounces. Its maximum power output is 14 watts, which makes it germane for high-consumption devices like laptop computers and satellite phones. The SolarRoll 9 ($279) outputs up to 9 watts, which is enough for most digital cameras and camcorders. It measures 12 × 40 inches and weighs 10.6 ounces. The smallest iteration, the SolarRoll 4.5, outputs enough power (4.5 watts) for cell phones, PDAs and other small devices. It measures 12 × 22 inches, weighs a mere 6.4 ounces and retails for $169. All three SolarRoll models are waterproof. During a trip, they can be rolled up into a small package for easy transport in a backpack. Two or more SolarRolls can be linked together if more power is needed to exponentially increase output and create a serious wilderness power station.